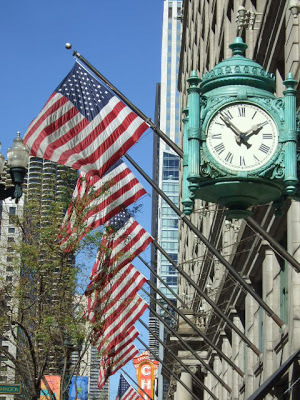 Monday marked the opening of our exclusive showroom at the Inland Steel Building in Chicago. 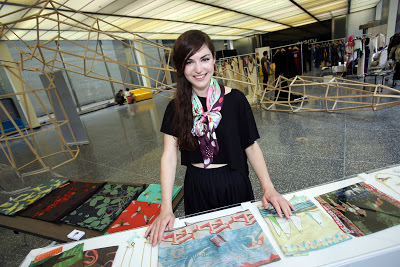 Five Scottish fashion and textiles designers were selected to take on the windy city with their exclusive ranges which included; my own label, Judy R Clark, alongside diverse divas Obscure Couture, the elegant fashion and interiors range of Iona Crawford, the intricate illustrated scarf designs of Redbrick and the soft and beautiful knitted wears of Eribe. First thing Monday morning the Obscure Couture girls and I got our platform high heels on (well they did and I stuck to my signature riding boots) to visit the boutiques we had researched before flying over. We met with boutique owners and stylists inviting them to our exclusive VIP launch on Wednesday. Meanwhile Iona Crawford was at Bloomingdales chatting about her new interior range, Redbrick were in Bucktown sourcing new spaces for their unique scarf range and Eribe were off meeting buyers. 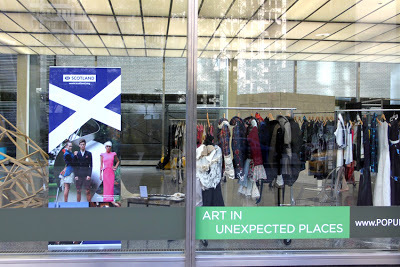 The showroom was manned by Chris Hunt, the man who founded Scotland Redesigned and who, along with the Scottish Government made it possible for us to showcase in Chicago, enabling us to platform our work to international audiences. 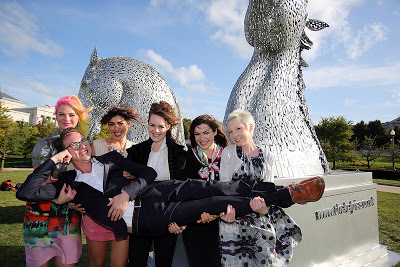 His team of pro’s and the Scottish Government’s right hand ladies were working relentlessly with buyers and press to maximise our exposure state-side. First thing Tuesday morning I received a phone call from Hunt,who informed me my wares were being coveted by a passing customer. I hailed a cab and went off to meet the lady in question. She was thrilled by the collection, was promptly measured up, and ordered a couple of bespoke Harris Tweed frock coats.The rest of the day was spent inviting buyers and bloggers along and attending to the guests who came by to view the collections. VIP launch day!We kicked off Wednesday with a 9am photo-shoot by the riverside. The model wore a show stopping bright yellow suit from label Obscure Couture. 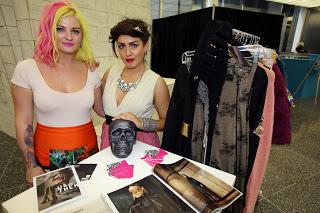 OC’s creative directors Jen Coyle and Lindsey Pagan were also in tow dressed in their unique provocative wears: the girls personal style never fails to impress! 11.45am and the sound of champagne corks opening marked the official launch of the VIP day. Our model displayed pieces from each designer throughout the day impressing the audiences with her tall slender figure, she could have made any outfit look spectacular. 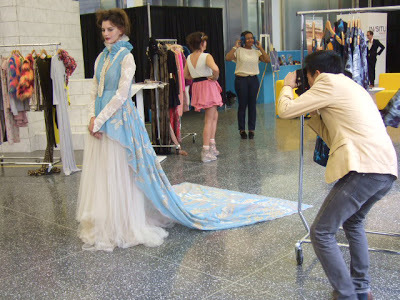 Fashion Journalists, bloggers and buyers visited the showroom each impressed with the diversity of the ranges on show. Elle decoration stopped by as did the owners of the exceptionally stylish Chicago boutique Sir and Madame as well as the infamous blogger Justin Barber from the Huffington Post and top local bloggers such as Fashionista Chicago. Brunch was served which included salmon bagels, scones and crannachan, the champers flowing. After a hectic day it was time for photo-shoot number two with the infamous Kelpies by sculptor Andy Scott which was situated in a prime location in the Grant Park overlooking Lake Michigan. Scott is the only non-American exhibiting in the major Chicago Sculpture International Exhibition as part of The Ryder Cup events so we were extra pleased to be photographed by his outstanding work.Large painted golf balls also decorated the city in celebration of the championships, each with a different message; some endorsing sustainable environments others with paintings of golfers and some promoting the famous Chicago town pizza!After a busy day of meeting and greeting the showroom closed its doors at 6pm, we walked down the riverside and dined in the sunshine chatting about the success of the show over some wine and eating some of the best steak frites the city had to offer. I was off to meet with one of the Boutiques I was in contact with before I headed out to the states. I packed my case with my precious lace gowns and Harris Tweeds, jumped in a cab and headed towards Daemen Avenue. An array of stylish boutiques and restaurants with a more bohemian vibe are dotted around this very and upbeat stylish neighbourhood.I am greeted by the petite, very attractive and friendly owner who welcomes me into her beautiful boutique.The boutique was elegantly industrial; stone walls, bare light bulbs, golden intricate thick framed mirrors, a range of old keys displayed on one of the walls and the window displayed some of oldest mannequins I have ever seen. A unique selection of clothing all made by individual designers adorned the rails in neutral shades with hints of sparkle. 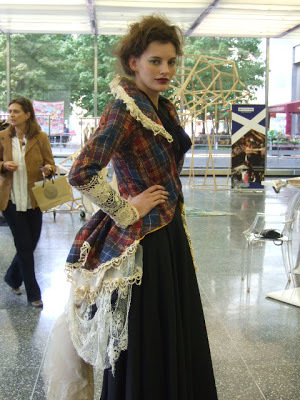 The owner fell in love with my lace range and tweeds which fitted in perfectly against the backdrop of the shop. After a successful afternoon it was back to the showroom to meet some leaders in fashion from the Fashion Institute. It was time to pack up our collections, take down the rails and head back home. Each company had successful ventures; gaining new contacts, new clientèle and buyers.I look forward to seeing what’s next for Scotland Re:Designed and watch as the designers they have championed grow, their success internationally flying the flag for Scottish fashion and textiles design.